The item requires 2 AA batteries to operate, not included. There are no cables or other accessories in the sale. You will get the unit only. 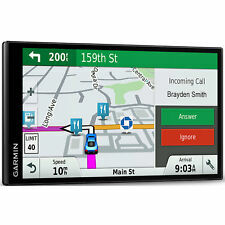 New Garmin Drive 5 USA LM EX 5" GPS Navigator (Next Gen Nuvi) w/ Lifetime Maps. Condition is New. Shipping is free. W orking but beat up ,screen has wear but is functional functionalCondition is Used. Wherever you’re going, have a smoother trip with Garmin Drive. The future is on your Garmin. Just look ahead and drive. 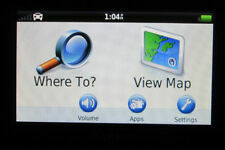 Garmin Real Directions feature guides like a friend, using recognizable landmarks, buildings and traffic lights. Very Nice Unit, Does Not Looked Used. See Pictures For What You Get and Condtion. Insturctional Videl. Pocket Size, Handheld, Motorcycles, Bikes, etc. Garmin DriveAssist 51 LMT-S. Traffic content not available for all areas. Also subject to change especially during peak periods. Photos for a single item will represent that item while photos for multiple quantities may only carry photos of single item to represent quantities. In excellent condition. Works perfectly. I've included a mini-USB cable. 2020 Updatedas Shown in Pics. 1 Garmin Window Mount Suction Cup. 1 Garmin TA20 Antenna Cord / Power / Charging Cord. Most Have a Weak Battery. PREVIOUSLY USED BUT IN GOOD CONDITION. Villa Muñoz (Retiro). Tres Cruces. Parque Rodó. Ciudad Vieja. Barrio Sur. Punta del Este. San Miguelito. Garmin edge 205 with original box and instruction manuals. See photos. Works great. A few light scratches on front top, last pic, otherwise excellent. NEW! Box has been opened for inspection Item is brand new! Garmin eTrex Touch 35t ​Model: 010-01325-13. LED light indicator. Output:5V. Genuine OEM orginal. Short circuit Protection. Light in weight and with heavy-duty cable-wire. Garmin Drivesmart 65 & Traffic GPS | 010-02038-02 | Authorized Garmin Dealer! Enjoy hands-free calling when you pair Garmin DriveSmart 65 with your compatible smartphone. Garmin DriveSmart 65. Garmin Real Directions™ Feature. Don’t Hate Traffic — Avoid It. Traffic receiver/vehicle power cable. GARMIN EchoMAP CHIRP 52cv with ClearVu Transducer GARMIN. echoMAP CHIRP 52cv. Cords plug directly into the mount, allowing you to quickly install and remove your device from power and mount. Transom and trolling motor mounts included. Gharb-Chrarda-Beni Hssen. Madīnat 6 Uktūbar. El Sheikh Zayed. El Omraniya. Boulak El Dakrour. Al Jīzah (Giza). United Arab Emirates. Saudi Arabia. From hands-free calling and live traffic information to Built-in Wi-Fi and more -the future is on your Garmin. Just look ahead and drive. Color:DriveSmart 51. Batteries: 1 Lithium ion batteries required. The STRIKER Plus 4cv fishfinder includes Garmin CHIRP technology combined with Garmin ClearVü™ scanning sonar for a nearly photographic, wide image of what passes below your boat. Paired with Garmin CHIRP traditional sonar for remarkable target separation, this transducer will help you catch more fish.